The Many Ways to Enjoy London Grove Township! London Grove Township is located in southern Chester County in Pennsylvania’s rolling Piedmont Region. The Township traditionally has been an agricultural community. While agriculture is still a major part of the Township, recently London Grove has become an attractive place to live and do business as development pushes west from Philadelphia and north from Wilmington, Delaware. The Township was incorporated in 1723 and is home to 8,300 people as well as dairy, horse and mushroom farms. We also are the home of Inniscrone Golf Club, the historic Village of Chatham, the Federally designed Wild & Scenic White Clay Creek, a vineyard and special events such as the Laurels at Landhope Combined Driving competition. 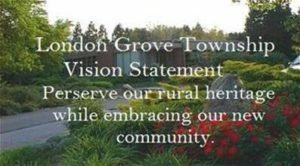 London Grove Township is a growing, progressive community committed to serving its residents. The 125-acre site was assembled by the Township over the past decade based on a most generous donation of 40 acres from Steven and Marna Goddard. The Park is located on the West side of Wickerton Road (Route 841) and stretches from the intersection of State Road down to the intersection of East & West Avondale Road. The park includes 3 miles of walking trails, a special “barn” playground with swings, 2 dog parks one for large and one for small dogs, community gardens, two parking areas and eco-friendly restrooms.